It is prescribed by optometrists and ophthalmologists worldwide because of its unquestioned effectiveness, both as a prevention of future vision loss from macular degeneration, as well as for patients with macular degeneration to slow down the progression. 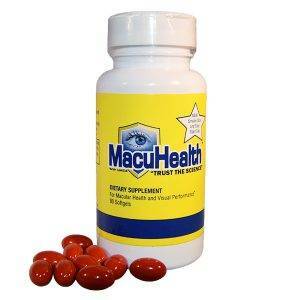 MacuHealth is an affordable way to prevent the leading cause of vision loss in Americans over the age of 60. When the macula of the eye is deficient in the three nutrients that provide the correct pigments for it, it can lead to permanent vision loss with macular degeneration. Consistent use of MacuHealth over a six month period has been shown in clinical trials to restore the pigment of the macula to normal levels in just six months. Reports of a study shown that patients with mild to moderate Alzheimer’s disease exhibit significantly less macular pigment, poorer vision, and a higher occurrence of age-related macular degeneration compared to people without Alzheimer’s disease. A study was conducted to investigate the impact of supplementation with the macular carotenoids on macular pigment, and vision and cognitive function in patients with Alzheimer’s disease compared with controls of similar age. Results of the study shown that supplementation with the macular carotenoids (meso-zeaxanthin, lutein and zeaxanthin) benefits patients with Alzheimer’s disease, in terms of clinically meaningful improvements in visual function and in terms of macular pigment augmentation. Read more about the study here.